(The detailed facts and figures of the havoc inflicted by IEDs are an eye opener for decision makers and opinion builders alike. Since the IEDs are an international threat and more so in the contemporary theatres of war, in countries such as Afghanistan and Pakistan, there is a dire need to pool resources, intelligence and wherewithal to combat and eradicate the menace – Author). The various theatres of the war against terror have resulted in the loss of countless human lives, both military and civilian, through the incessant use of a weapon known as an improvised explosive device (IED), also identified as a roadside bomb. An IED is generally a rudimentary homemade explosive device constructed and deployed in ways other than conventional military action. With the passage of time, IEDs are becoming more and more lethal and the addition of ball bearings or iron/steel shrapnel not only cause greater damage but result in maiming a large number of victims. Hiding the IEDs in seemingly harmless containers like household utensils, food packets and more horrendously in toys, result in greater casualties. The Geneva Convention has placed a ban on the use of anti-personnel mines and IEDs but research indicates that for more and more terrorist organizations and armed non-state actors (NSAs) the use of IEDs is becoming a weapon of choice due to their low cost and easy availability. The situation has become so grim that it merits independent study to identify the problem and recommend ways and means of reducing the damage caused by all types of IEDs. The term “Improvised Explosive Device” originated with the British Army in the 1970s when it came across explosives constructed by the Provisional Irish Republican Army (IRA) with the help of agricultural fertilizer and semtex smuggled from Libya to make highly effective booby-trap devices or remote-controlled bombs. One of the first examples of coordinated large-scale use of IEDs was the Belarusian Rail War launched by Belarusian guerrillas against the Germans during the Second World War. Both command-detonated and delayed-fuse IEDs were used to derail thousands of German trains during 1943–1944. The first exposure to IEDs by US troops was during the Vietnam War, where the Viet Cong employed them to target land and river-borne vehicles as well as personnel. They were commonly constructed using materials from unexploded ordnance of the US. Thirty-three percent of US casualties in Vietnam were officially attributed to the IEDs; these figures include losses caused by both IEDs and commercially manufactured mines. In the second Iraq War, IEDs have been used widely against coalition forces and by the end of 2007 they had become responsible for approximately 63% of coalition deaths in Iraq. IEDs have been commonly used In most insurgencies in the recent past. Cadres of the rebels in Sri Lanka like the Liberation Tigers of Tamil Eelam (LTTE) mainly used IEDs against military targets before the LTTE was dismantled in mid-2009 by the Sri Lankan military forces. In India and Nepal, IEDs are increasingly being used by Maoists. On 13 July 2011, three IEDs were used by the Indian Mujahidin Group to carry out a coordinated attack on the city of Mumbai, killing 19 people and injuring 130 more. IEDs were also widely used in the 10-years long civil war of the Maoists in Nepal, ranging from those bought from illicit groups in India and China, to self-made devices. Typically used devices were pressure-cooker bombs, socket bombs, pipe bombs, bucket bombs, etc. The devices were used more for the act of terrorizing the urban population rather than for fatal causes. Home-made IEDs were mainly responsible for the destruction of structures targeted by the Maoists and assisted greatly in spreading terror among the public. The experience of the United States in facing attacks by IEDs on home ground merits a brief mention. At 9:02 a.m. on April 19, 1995, a 5,000-pound bomb, hidden inside a Ryder truck, exploded just outside the Alfred P. Murrah Federal Building in Oklahoma City. The explosion caused massive damage to the building and killed 168 people, 19 of whom were children. Those responsible for what became known as the Oklahoma City Bombing were terrorists, Timothy McVeigh and Terry Nichols. This deadly bombing was the worst terrorist attack on US soil until the September 11, 2001 World Trade Center attack. In January 2011, a pipe shaped bomb was discovered and defused at a Martin Luther King Jr. memorial march in Spokane, Washington. The FBI said that the bomb was specifically designed to cause maximum harm as the explosive device was, according to the New York Times, packed with fishing weights covered in rat poison, and may have been racially motivated. No one was injured during the event. On May 4, 2010, Faisal Shahzad, a US citizen of Pakistani origin attempted to blow up Times Square through an IED constructed with the help of Urea based fertilizers planted in a van. Fortunately, the bomb failed to explode and Mr. Shahzad was arrested while attempting to flee on a Dubai bound flight. IEDs have also been used extensively in Chechnya, Lebanon and Israel. Afghanistan has had its fair share of casualties caused by the use of IEDs by insurgents. It has been estimated that since 2001—to the present date, 66% of coalition casualties have been caused by IEDs. Owing to its proximity to Afghanistan and involvement in the war on terror, Pakistan too has suffered immensely due to IED attacks. 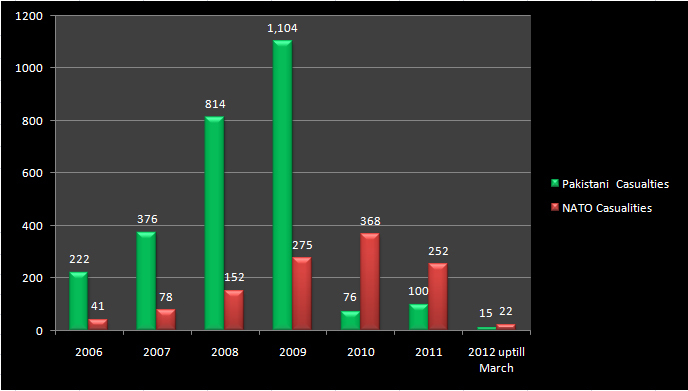 The available data reflects that casualties caused from IEDs are on the rise. The data collected from official and other sources shows that IED explosions caused 67% of casualties from the year 2002 to 2011. As many as 1,011 security force personnel have embraced martyrdom while 1,627 were injured due to 574 IED blasts in the Khyber Pakhtunkhwa province alone. In Balochistan, during the last four years, 1,479 incidents of IED blasts were reported which resulted in the death of 991 civilians and 71 security force personnel. In addition, 513 civilians and 121 security force personnel were injured due to these attacks. A total of 399 incidents have been reported in Balochistan where militants targeted gas pipelines, electricity pylons and railway tracks during the last three years. The case of Afghanistan merits a more detailed examination. It is ironic that about six months before the invasion of Afghanistan by the Soviet Union on 27 December 1979, the Afghan Mujahedeen were supplied with large quantities of military supplies from the United States. Among those supplies were various types of anti-tank mines. The insurgents often removed the explosives from several foreign anti-tank mines, and combined the explosives in tin cooking-oil cans for a more powerful blast. After an IED was detonated, the insurgents often used direct-fire weapons such as machine guns and rocket-propelled grenades to continue the attack. Afghan insurgents operating far from the border with Pakistan did not have a ready supply of anti-tank mines. They preferred to improvise IEDs from Soviet unexploded ordnance. The devices were rarely triggered by pressure fuses. They were almost always remotely detonated. 9/11 changed the scenario. Ever Since the 2001 invasion of Afghanistan, the Taliban and Al-Qaeda have employed IEDS to target NATO and Afghan military and civilian vehicles. This has become the most common method of attack against NATO forces, causing damage as well as delaying convoys in time consuming IED clearance operations. The IED attacks increased consistently year after year as the expertise and access to explosive devices and trigger mechanisms along with the sophistication in technology and knowhow increased. In January 2010, it was reported by military experts that Taliban fighters had developed a new generation IED that was supposed to be almost undetectable, because it had no metal or electronic parts. The expertise for this new generation most likely came from foreign fighters and these devices were being mass produced covertly on an industrial level. Before this new development, IEDs would be mostly triggered by two hacksaw blades separated using a spacer. Stepping on or driving over these blades would close an electronic circuit that detonated the explosive – often an artillery shell. In the newer versions, the metal saw blades have been replaced with graphite blades and the artillery shells with ammonium nitrate. The damage is, therefore, caused by the power of the blast rather than by metal fragments, or shrapnel. According to a recently released report by Homeland Security Market Research in the USA, the number of IEDs used in Afghanistan had increased by 400 percent since 2007 and the number of troops killed by them by 400 percent, and those wounded by 700 percent. It has been reported that IEDs are the number one cause of deaths among NATO troops in Afghanistan. The rising number of IED attacks raised the alarm among the allied forces operating in Afghanistan, when they hit a record high of more than 16,000 in the past year. The military leadership took cognizance of the fact that they were causing increasing harm to Afghan civilians. According to data compiled by the daily USA Today, the number of improvised explosive devices that were cleared or detonated rose to 16,554 from 15,225, an increase of 9%. In 2009, total IED “events,” as they are known, came to 9,304. Insurgents in Afghanistan continued to rely on IEDs as their main weapon. Civilians, were increasingly becoming the main victims. According to figures released by the military command in Kabul, the number of Afghans killed or wounded by IEDs increased by10% in 2011. Bombs account for 60% of all civilian casualties, which amounted to more than 4,000 killed or wounded in 2011. Insurgents caused more than 85% of those casualties. The International Stability Assistance Force (ISAF), which oversees coalition military operations, attributed the spike in civilian casualties to the lack of control insurgent leaders have on their forces. According to Lieutenant Colonel Jimmie Cummings, an ISAF spokesperson, despite orders from Mullah Mohammad Omar, the Taliban leader, to quit harming civilians, there has been an increased use of IEDs harming Afghan adults and children. Seth Jones, an expert on Afghanistan, currently working for the think tank RAND Corporation, opines that the Taliban are likely to lose popularity amongst the local Afghans if they persist in harming civilians through IEDs. Meanwhile, serious thought has been given in the US and elsewhere to minimize the risk emanating from the persistent use of IEDs in Afghanistan. According to a Washington Post report, US Military officials have concluded that an increase in attacks was expected, given the surge in US and NATO troops accompanied by intensified combat. IED attacks have increased, despite a fresh wave of war-zone countermeasures, including mine-clearing machines, fertilizer-sniffing dogs and blimps with sophisticated spy cameras. The daily reveals that the US military has struggled for years to find a remedy to homemade explosives. IEDs—concocted primarily of fertilizer and lacking metal or electronic parts that would make them easier to detect—are the largest single cause of casualties for US troops. Lieutenant General Michael L. Oates, the director of a Pentagon agency dedicated to combating these bombs, has, however, observed and quoted military statistics that suggest that the percentage of IED attacks that have inflicted casualties—on US, NATO and Afghan forces, as well as Afghan civilians—has actually declined in recent months, from 25 percent last summer to 16 percent in December. Oates and other US military officials have emphasized figures showing that IEDs killed fewer troops in the NATO-led coalition last year than in 2009—a slight decline, from 447 to 430. Juggling with statistics is not the answer. The Pentagon created Oates’s agency, the Joint IED Defeat Organization (JIEDDO), in 2006 to coordinate efforts among the armed services. With an annual budget of about $3.5 billion, it is supposed to speed the deployment of counter-IED programs to Iraq and Afghanistan. The program did not receive standing ovation as critics—including members of Congress, the Government Accountability Office and some military officers—have said that JIEDDO in the past moved too slowly and wasted money on unproved technologies. Such concerns took on new urgency in December 2009, when President Obama announced an expansion of the Afghan war and deployed 30,000 additional troops. Around the same time, then Defense Secretary, Robert M. Gates created a separate high-level task force—led by Marine Lieutenant General John M. Paxton Jr. and Ashton B. Carter, the Pentagon’s chief weapons purchaser—to send more counter-IED equipment to Afghanistan to coincide with the troop increase. One of the remedial measures adopted comprises the blanketing of the Afghan skies with blimps. Unfortunately ample data does not support the blimps’ effectiveness or otherwise but US defence claim that they have received anecdotal reports of the airships catching insurgents burying IEDs. Meanwhile, US Air Force Colonel Scott Murray, who served as the US military’s chief of intelligence, reconnaissance and surveillance operations in Afghanistan until recently, has commented that airborne spy cameras are more useful to detect patterns of movement that can provide information about how insurgent networks function. In addition to the blimps, he said, the military is relying on a range of surveillance technologies to gather intelligence about bomb builders. The equipment includes high-flying Global Hawk drones as well as cameras mounted on a stick, which foot patrols can use to peer into culverts and under bridges. Afghanistan, which remains the main theatre of war in the region, continues to be in focus, however, so does Pakistan for a variety of reasons. The case of Pakistan requires examination, both for it being a target of IED attacks and also for finding a solution for reducing or eliminating this threat. Pakistan is faced with a double edged sword while confronting the IED menace. The more apparent and obvious issue being the incessant use of IEDs by miscreants resulting in the loss of precious human lives. In addition, Pakistan is being blamed for alleged complicity in the transportation of raw material (Ammonium Nitrate) used in the preparation of the IEDs. Furthermore, according to JIEDDO, Pakistan is the source for 80% of the fertilizer-based homemade bombs in Afghanistan. Seth Jones has claimed that the bombs (IEDs) cause 90% of U.S. casualties. He believes that IEDs will continue to plague the coalition and civilians but simultaneously takes a swipe at Pakistan, stating: “This is likely due to the ability of insurgents to import IED materials, including triggering devices and ammonium nitrate, from Pakistan.” Reports such as this prompt US legislators to recommend punitive action against Pakistan. Senator Robert Casey, a Democrat from Philadelphia has pushed Pakistani officials to stem the flow of bomb-making materials. He acknowledges that there has been progress, including the formation of counter-IED teams in Pakistan. But Casey says that he was “not satisfied” that enough was being done to secure the border. A number of international bodies and think tanks have conducted research but trust deficit between Pakistan and its erstwhile allies in the war on terror has led the studies into the subject to be tainted by mistaken perceptions and accusations of Pakistan’s complicity in the heinous crime. One report by the “Perceptors Group”, which painstakingly conducted an in-depth study on the issue of human sufferings, specifically caused by IED attacks, in Pakistan and Afghanistan stands out for its objective observations. Some analysts, perhaps owing to their own biases or due to unreliable input, point fingers at Pakistan’s alleged involvement or having lax control on IED material transportation. Any study, which takes into account only perceptions and not facts, must be taken with a pinch of salt. The “Perceptors Group” claims that to ensure the credibility of its report, it collected secondary data from diversified sources ranging from reviews conducted by other credible groups, individual research of intellectuals, US and Pakistan government based facts and figures released from time to time and data compiled by international NGOs and think tanks working on both, Pakistan and Afghanistan. The above-mentioned data and graph shows that almost every other IED attack on Pakistani security forces was more fatal than the attacks on NATO forces in Afghanistan. On the Pak side IED attacks fig of 4824 may actually be higher as this record mostly includes Frontier Corps. Note:- Security forces figure of 2010/2011 pertains to Civil Armed Forces (CAF) operating in Fata and Balochistan. Figures of other LEAs and the Army operating in the area are expected to be much more. Law Enforcing Agencies (LEAs) and the Army operating in the area is expected to be much more. The allegations against Pakistan cannot be brushed aside as mere pressurizing tactics or biased opinion. Where there is smoke, there is fire. Poor governance, corruption and lax control in Pakistan have benefitted terrorist groups. These gaps in the system must be plugged without prejudice. A Democrat Senator, Richard Blumenthal, has claimed, in the US Senate hearing on the issue of IEDs, that Pakistan remained the main source of the materials used for making the devices. During the same hearing, General James Mattis termed it an area of frustration and serious topic of dialogue with Pakistan. Simultaneously, US Rep. Ted Poe, a Republican from Texas, who serves on the House Committee on Foreign Affairs, stated in a column in Newsmax that Pakistan is the “Benedict Arnold” (a rebel General and traitor in the US Revolutionary War) to America in the war on terror. JIEDDO’s observation regarding the porous border is a harsh reality, However, Pakistan’s earlier recommendation of fencing the Durand Line and installing biometric identification systems at crossing points was vehemently opposed by the Afghans and ignored by the US. That does not absolve Pakistan from maintaining vigilance. The perceptions of US legislators, think tanks and opinion makers must be taken into cosideration. 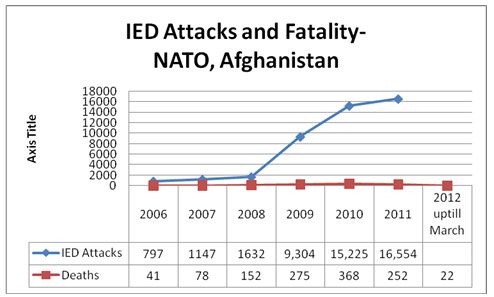 Some facts, which can help negate false perceptions are that the IED attacks alone in Pakistan have taken lives of 2,707 soldiers in comparison the 1,188 NATO soldiers in Afghanistan from 2006 to 2012. As of 2010. There are 821 Pakistani check posts on the Pakistan-Afghan border against the 112 check posts set up by NATO-US-Afghan troops on their side. The total number of Pakistani troops operating on the Pak-Afghan border is approximately 140,000 in comparison to NATO-ISAF’s 130,386. Pakistani troops patrolling the Durand Line, however, should be maintaining greater vigil, not only to counter perceptions but for their own safety as well as they themselves are the primary targets of these IEDs. Pakistan has undertaken major efforts to stop the free flow of Urea to Afghanistan, including cutting dealership in the northern region and changing the color of fertilizer to track it. IEDs, however, continue to be used against security forces deployed in FATA, Balochistan and Afghanistan. In December 2011, a US delegation visited a fertilizer industry in Multan to seek their cooperation to stop the flow of fertilizer. It was explained to them by the owners that targeting Pakistan as the sole supplier of the ammonium nitrate was unfair since huge quantities of this fertilizer was being exported to Afghanistan from the US, Australia and China and smaller quantities from Tajikistan, Iran, Uzbekistan and Saudi Arabia. The company involved in production of fertilizers in Pakistan has, since then, changed the identification of its bags by using different colours, dyed the fertilizer to distinguish it from harmless products and reduced its supplies and dealerships in northern regions of the country. Last year, executives from the US chemical manufacturer, Honeywell, traveled to Pakistan to pitch to Pakarab (a major producer of fertilizer) the merits of Sulf-N 26, a fertilizer that combines ammonium nitrate with ammonium sulfate, a fertilizer and fire retardant. Honeywell unveiled Sulf-N 26 in 2008 in response to security concerns after the Oklahoma City bombing, and promoted it by suggesting that it remains safe when mixed with fuel. According to Pakarab and Best, the expert at JIEDDO, tests conducted in the US showed it could still be used in the production of bombs and the project was shelved. Honeywell, which said it had not been informed about the tests, disputed that conclusion. Pakistan is being pressurized to formalize legislation on the subject. Indeed it must. Pakistan can expedite the process but it should be understood that water starved Pakistan, whose economy as well as survival depends on agriculture will require the use of fertilizers. Alternate sources must be developed so that its own people do not suffer. It imperative that in light of the “Perceptors’ Report”, Pakistan needs to present its case to the world. 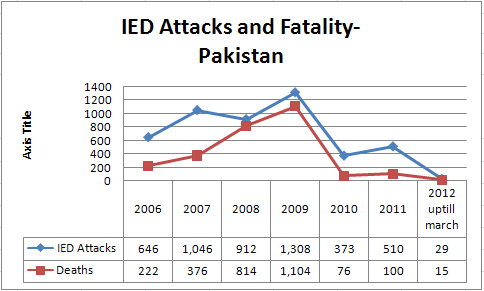 The fact is that Pakistan is the main victim of IED attacks and its efforts have not received due coverage. Additionally, JIEDDO should expand its role by helping Pakistani authorities and security forces to check the rise in IED attacks. Sharing of air surveillance and on ground IED detection hardware (i.e. PTDS, PGSS, GPR, Goldie, devil pup etc.) can be helpful to neutralize the threat along Pak-Afghan borders. NATO should endeavour to raise the number of check posts along the Pak-Afghan border. This lack of security is allowing hostile forces free movement in the Afghan side to reorganize their strength and hit back at Pakistani law enforcing agencies and civilians. In addition, Pakistan needs to establish legislation to control the production as well as distribution of fertilizers, which have alternate uses in the preparation of IEDs. The international community should also express empathy towards Pakistan’s plight and appreciate that Pakistan is a country suffering from an acute shortage of water. Its per capita water availability ranks at the bottom of the list of 26 Asian countries making fertilizers a crucial requirement for the agricultural sector. Viable solutions must be considered for Pakistan. The government of Pakistan should organize an international conference on terrorism with special emphasis on the impact of IEDs on Pakistani society and economy. All regional stakeholders should be invited to discuss measures and share available technology to save human lives. Since Pakistan is not alone in suffering the bane of terrorism and devastating effects of IED attacks, successful measures developed by other nations, if any, should be shared to make the world a safer place. This has to be a collective effort. The author is a former Group Captain who served as Naval and Air Attache at Riyadh. He is currently a freelance columnist and hosts a current affairs talk show on TV. Stockfish, David; Yariv Eldar, Daniella HarPaz Mechnikov (1970), Dokszyc-Parafianow Memorial Book—Belarus (Sefer Parafianov. Tel Aviv: Association of Former Residents of Dokszyce-Parafianow in Israel. p. 274. Marolda, Edward J., Mine Warfare in South Vietnam,. Washington: Naval Historical Center, 1994.